Today is Pearl Harbor Day, the anniversary of the day when the Japanese bombed a naval base in Hawaii killing thousands and drawing the United States into the Second World War. I’ve written several posts commemorating historical events, but usually in a spirit of fun and frivolty. In real life, I do my humble best to take history seriously when appropriate. Ours is not an age that pays much attention to history. Anniversaries of major events in our history go past and we barely notice. The media barely mentions them, if at all. I’d wager that the majority of Americans will not even note that today is Pearl Harbor Day. But history matters. The attitude that we take towards past events shapes how we deal with present and future events. Keeping ourselves aware of history helps us to remember what sort of things guided civilization to its present state, and what will continue to guide us in the future. Please take some time today to remember those who died at Pearl Harbor and all those who fought in the Second World War, or any other war. It’s now late in the evening of September 10. Tomorrow we will comemorate the anniversary of one of the most important events in human history, a time when the forces of Muslim extremism launched a brutal attack on of the greatest cities in western civilization. But though taken by surprise, the defenders of the West united and made clear that they would never be defeated. The date I’m refering to, needless to say, is September 11, 1683, when the Ottoman Turks were laying seige to Vienna, capital of the Austrian Empire. Acting in accordance with an earlier treaty and following an appeal from the Pope, King Jan Sobieski of Poland led his army to the defense of the beleagured city. 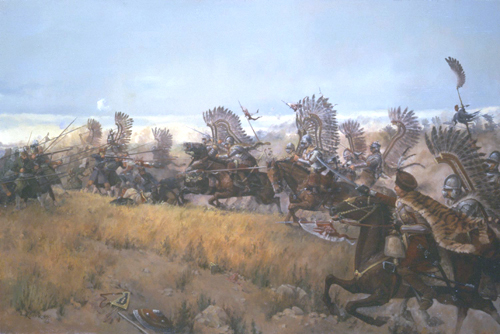 Finding the Turkish force unprepared, the Polish army attacked at once and easily routed the enemy. This was the last time that the Ottoman Empire posed a serious threat to central Europe. Today, many of us know very little about history, and even those who do probably don’t pay much attention to the history of eastern Europe. For myself, I knew nothing of the siege of Vienna until I read Hilaire Belloc’s The Great Heresies. Belloc truthfully reminds us that though we tend to be dismissive of Muslims as backwards, their civilization was larger and stronger than ours for many centuries. It is only because of a centuries-long string of heroics by men like Sobieski and his army that Christian civilization survived the constant attacks from the south and east. We owe them endless thanks and praise.